This book was recommended to me a couple of weeks ago, and I am glad I picked it up. I’d seen Touré on television on numerous occasions but had no idea of his written work. 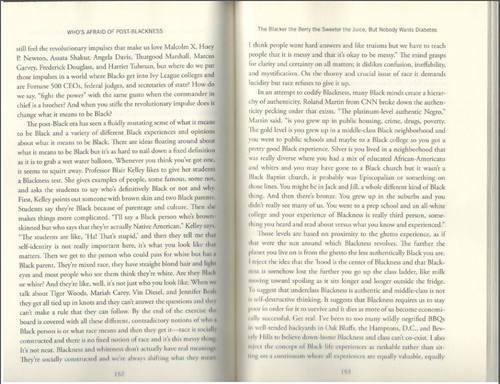 In the book he was able to reflect on his own experiences and those of other influential blacks. I thought the book stayed very relevant to the times, while discussing the harsh realities of growing up black in the 60s and 70s while not slighting the struggles of today’s black youth and young men and women. Yes there are many resources and opportunities available today that our elders could have never dreamt of, however; obstacles and barriers still exist. When speaking of today’s institutional racism he stated “the death of your self-esteem by 1000 cuts can still lead to the murder of your soul.” This to say the most racist thing to ever happen to you won’t be blatant, and you probably will have no idea of its existence (i.e. you don’t get the promotion because of your race etc.). 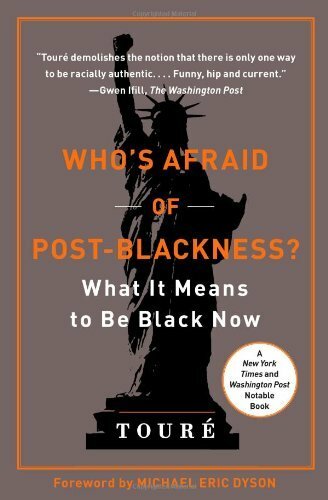 The book was filled with interviews from successful black people that spoke candidly about identity. While speaking about the inequities of our society Chris Rock added, “The black man’s gotta fly to get to somewhere the white man can walk too.” While Paul Mooney noted that “We complain about racism but we don’t wish to change costumes.” This quote was interesting to me for a few different reasons. One, because I agree, secondly; because while recently in Los Angeles visiting the Fung Brothers we had a long conversation about race when David came to the same conclusion. Black-American’s and Asian-American’s have many things to complain about, but neither side would want to trade places with any other race on this planet. I suppose the pride that comes with the culture is deeper than the struggle. While I feel we all wish to end most of the struggles, we never lose sight of the pride that comes with history and culture. It is my thought that we must look at the story of what it means to be black from a different angle. Reverend Al Sharpton stated, “We are not victims we’re victors.” From the depths of slavery and oppression, which were key elements marked in American history, black folks were brought together and created community. It takes community and unity to survive through trials and tribulations. Black movements for equality ere deemed radical for being more blunt and direct regarding their feelings about the system and what they wanted, while other movements focused on peace and non-violence. This is not to say one way was better than another, but personally I believe both were necessary. In a way it shows how different we are as people. Everyone views the world through different lenses. These two pages were probably my favorite in the book. Ironically in the same conversation with the Fung Brothers, David asked me if I thought the notion of black men always feeling the need to “keep it real” or be “authentic” was holding us back from achieving economic success. While, my first thought was YES among other things, when answering questions that require me to speak to my identity based on race I have to think about the answer and what other things may be implied in the question. Eventually I agreed, however I pointed out that there is probably a laundry list of items that can be added to this list. Furthermore, that being Chinese-American male’s whom often speak about their racial identity they had to understand why black men may fear being emasculated. Especially living in a country where Asian males in general have been emasculated by the American media. I believe somewhere in the middle is where we should be, between wanting to keep our identity, but also being able to turn DOWN enough to gain success without sacrificing whom we are. While we should not stop wearing hooded sweatshirts, we should also be aware of the harsh consequences. There are consequences to losing your identity and comfort, however, there are also consequences for not caring and/or not knowing. Admittedly those are hard realities and hard sentences to write because do we embrace the hooded sweatshirt and tell people to embrace identity, or do we tell them to dress differently to make others around them comfortable and success will come. What if success doesn’t come? What if instead of being uncomfortable about your hooded sweatshirt your skin color makes them uncomfortable? THIS cannot easily be changed. Nevertheless I do not have the answer, but one must find their own. Furthermore the 2 pages really touch on the fact that race is socially constructed, our true identities should not be. We can be whoever we want to be, and should never let something like race stop us. Society tells us we can be black or we can be successful, but we can’t be both. Because although we can act like we don’t know what the term “acting black” is, we all really do. When did acting black become being ignorant? That’s a whole other can of worms. The fact that in order to be authentically black one has to be in poverty, or in close proximity to the ghetto is ridiculous. Before I place blame or point a finger at anyone I will look in the mirror and fix myself. For me that’s where it starts, and educating the people around us about how unrealistic these standards can be. In a society that’s still in the beginning stages of this digital age keeping it real and being authentic won’t get anyone too far for too long. We now have easier access to take advantage of free resources and opportunities. While we encourage each other to be ourselves remember the internet is a footprint that cannot be erased permanently. In closing President Barack Obama spoke to young black men in his recent commencement speech at Morehouse College. “Don’t take a vow of poverty, but it’s poverty of ambition to think only of the goods you can buy versus the good you can do.” As black men continue to do great things and open doors everyday as they have always done, there will be those who complain about the resources and opportunities we do not have, and there will be those who take advantage of the ones that we do to create the unimaginable. At the end of my conversation with the Fung Bro’s we all anticipate what President Barack Obama will do after office. We are more than confident that he will continue uplift the black community, which will in turn inspire the world. We must all continue to do our part, stay educated, stay focused and keep looking up! This entry was posted in All Writings, Blog, Written By AmbassadorNique and tagged .com, afraid, ambassador, AmbassadorNique, AMBASSADORNIQUE.COM, america, asian, being, black, blackness, book, bros, fung, identity, Nique, now, Obama, of, post, Productions, race, review, Seattle, toure, tumblr, twitter, who's. Bookmark the permalink.